Having afternoon tea is by far my favourite thing to do (can you call eating afternoon tea a hobby?) I love everything about it - the fact that it is shared, that it looks beautiful, is usually served in beautiful surroundings, it's classy, and yet it is so greedy. 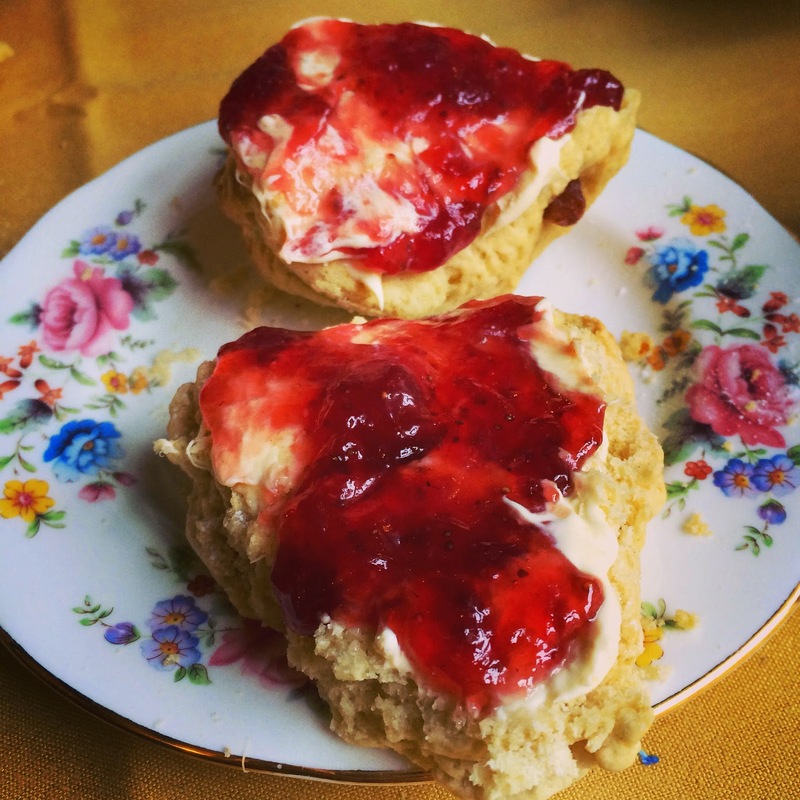 Anyone who reads this blog regularly will know how much I love my food - so any meal which means you can eat sandwiches, a selection of cakes AND scones with clotted cream and jam is a winner in my book. A while ago I spotted this list of '21 Absolutely Charming Tea Rooms You Have To Visit Before You Die' over on Buzzfeed. 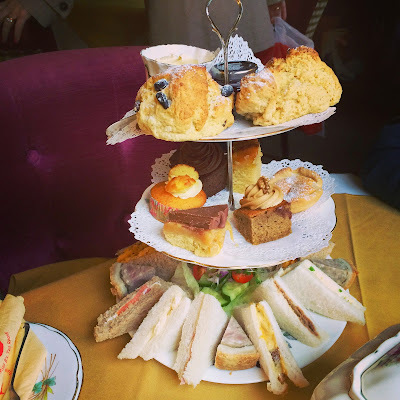 I loved the idea of having a list of top places to have afternoon tea, and couldn't wait to have a read to see if there were places on the list I'd heard of/been to already. I hadn't heard of all of them - but some of them were already on my "Bucket List" (Betty's of Harrogate, and Claridge's). 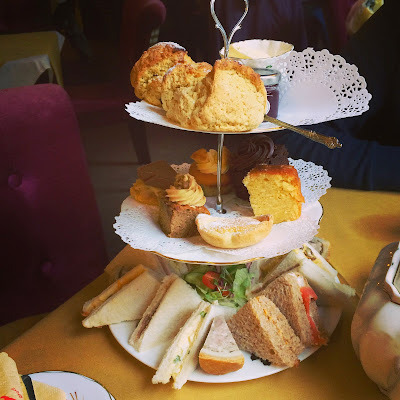 There are a couple of places that serve afternoon tea that didn't make it to the list on Buzzfeed, but that I'd certainly add to my top list: The Goring (London) being one, and Luton Hoo Hotel (Bedfordshire) being another - both of which are renowned for their awesome afternoon teas. 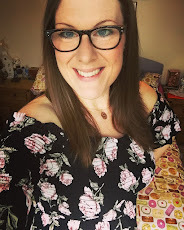 I'm not one to turn down writing a list, so I've picked the places that I would like to visit the most and have created an afternoon tea specific bucket list! They are all located in places I either visit regularly or are in places I'd like to visit or holiday to in the future. As I visit each one, I'll come back to this list and tick it off - I have no need for speed on this one (calorie counting and weight loss aren't the best partner for afternoon tea) so, just as and when the opportunity arises to visit one, I will. As you can see, one of the places is already ticked off - and that's because we had the opportunity to visit there this weekend. 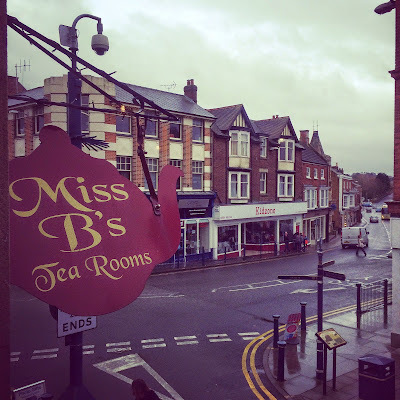 Miss B's Tea Room in Melton Mowbray caught my eye, as I knew we'd be driving past Melton Mowbray on our journey up the A1 to Yorkshire for my review stay at Ox Pasture Hall Hotel in Scarborough last weekend. It seemed like fate had thrown the top afternoon teas list my way, and it would be rude to turn my back on fate, right? So I booked Liam and I in for their luxury afternoon tea for lunch on Saturday, to help break up our long drive to Yorkshire. Miss B's did not disappoint - situated in the heart of the sweet market town of Melton Mowbray, this quaint and very traditional tea room ticked all the boxes for me. 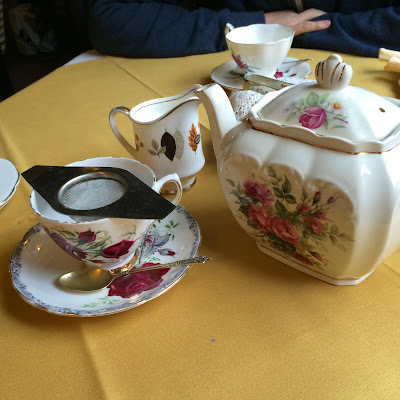 We had opted for their 'luxury' tea option, and it really knocked our socks off. The tea room is situated on the upper floor of a charming listed building in the market square. The friendly staff were dressed in traditional black dresses and white apron/cap combos, and the whole tea room is decorated with a stunning vintage vibe. 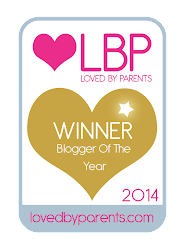 In fact, both hubby and I said we felt as if we were being transported back in time! I have eaten a fair few afternoon teas already in my 28 years, and this was by far the best one I've ever had. The sandwiches were fresh and there was SUCH a selection; the smoked salmon was the most delicious I've ever tasted, and the Coronation chicken and potted beef were especially good. The homemade cakes were where this afternoon tea specifically shone - each one was truly wonderful - they tasted truly homemade, and looked brilliantly rustic. As well as the sandwich selection we were also served two wedges of Melton Mowbray pork pie each - it was of course, amazing, as expected being as we were dining in its home territory. It was really nice to enjoy the extra savoury item on the stand - true afternoon tea decadence. For me, the best part of afternoon tea is always the scones with clotted cream and jam - I believe that without a doubt it is the best foodie trio around, and it will always be my treat of choice. There is something so comforting about a cream tea, even more so when its served with sandwiches, cakes and a pot of tea to boot. The scones at Miss B's were still warm and perfectly crumbly. The clotted cream was thick, unctuous and tasted perfectly decadent. The strawberry jam served was Wilkin & Sons Tiptree Strawberry Jam, which is always my jam of choice too. I did happen to notice that they serve giant slices of the millionaires shortbread if you're a one cake only kind of person. They also have a brilliant selection of other homemade cakes by the slice, as well as a full lunch menu serving sandwiches, toasted sandwiches, homemade quiche and of course, Melton Mowbray pork pie. I thought the luxury afternoon tea was incredibly good value for money - for the amount of scrumptious food you are served it is an absolute bargain at £14.95 per head. I've seen places charge double that for measly portioned cakes with zero charm in comparison to the ones served at Miss B's. 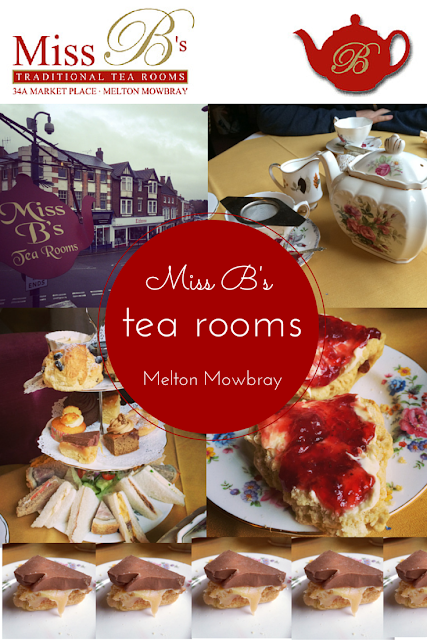 I would whole-heartedly recommend Miss B's Tea Room to anyone who wants to enjoy a truly perfect afternoon tea - if you happen to be visiting Melton Mowbray, or can find a reason to stop by, then do! 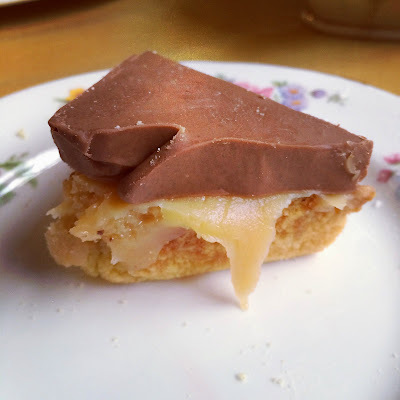 You will not regret it but your waistline might! Thanks to the lovely staff at Miss B's for making us so welcome, I'm absolutely sure we'll be back again one day!